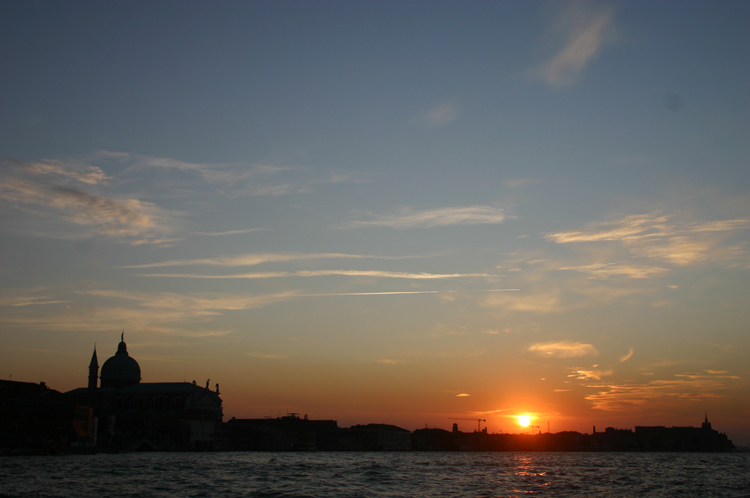 Venice hits you with the most intense assault of man-made beauty anywhere on earth. Almost any walk here would be unforgettable. This is our effort at creating the best walk for the visitor with only one day. Its back canals are arguably more delightful than its famous sites, and this walk allows plenty of time in the backwaters. 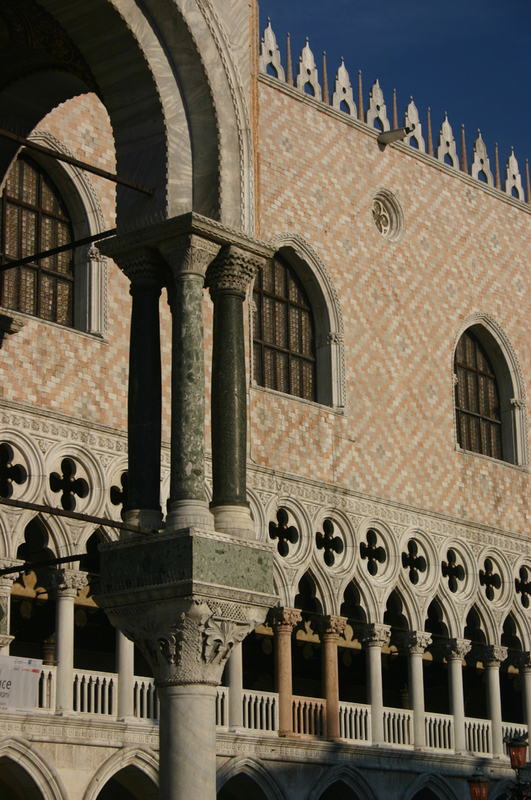 From the Arsenale, the underpinning of Venice's maritime strength, stroll along and behind the waterfront to the magnificent St Mark's Square, dominated by St Mark's Basilica, the Doge's Palace and the famous Campanile, taking in various favourite sites on the way. 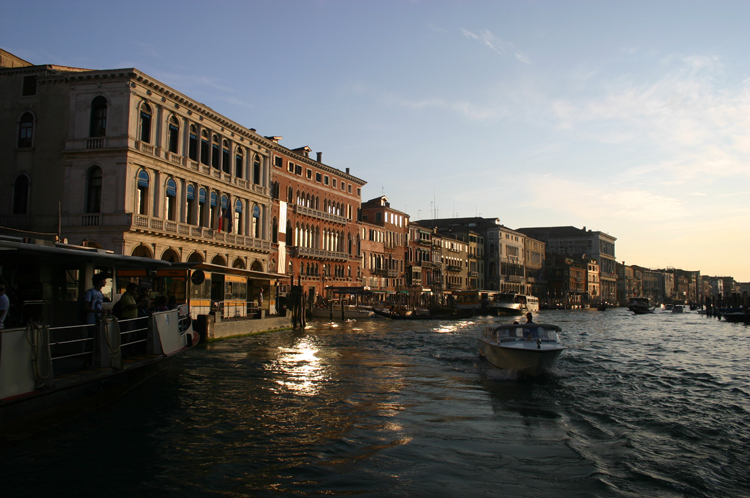 Circle northward through quieter lanes and back to the Rialto bridge (crowded but essential), where you can spend hours gazing on the sublime Grand Canal and its pullulating traffic. 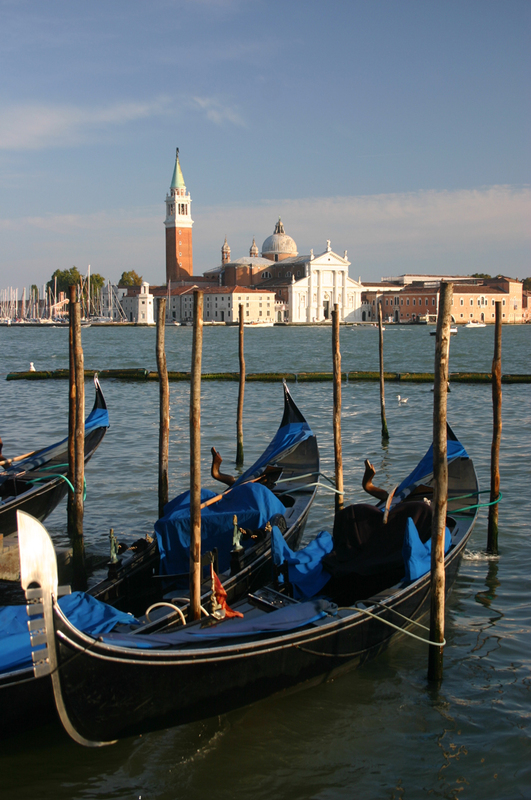 Then wind along dark passages in the entrails of the Dorsoduro, taking in the Frari church and other marvels, and enjoying its lovely squares and the Zattere waterfront, to the Dogana at the Grand Canal's end. Take your time: it would be negligent not to include lunch in a square or on a back canal, and jitter-inducing quantities of coffee, into the day. 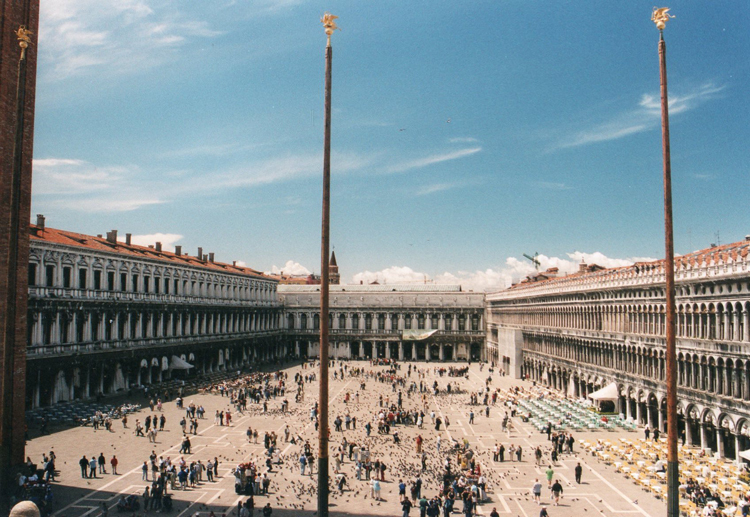 Note: Negs: extreme tourism; crowds. 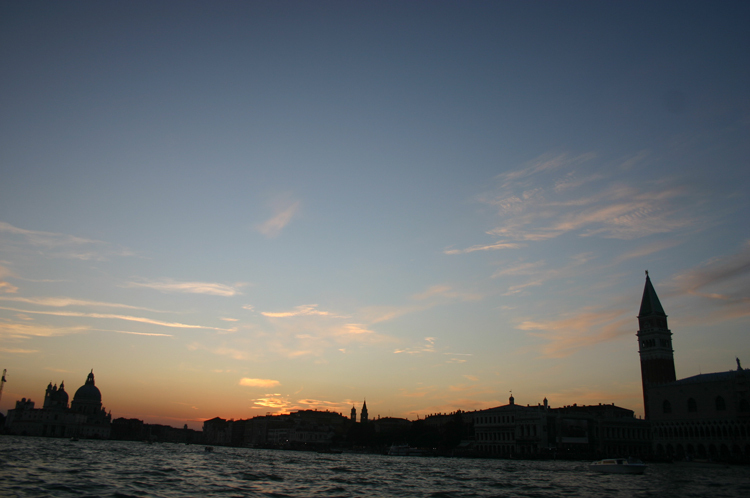 To be honest, all Venice is wonderful, and devising the perfect one-day walk therefore almost impossible: like many, we spend happy days by the quiet back canals and groan at the thronged thoroughfares. 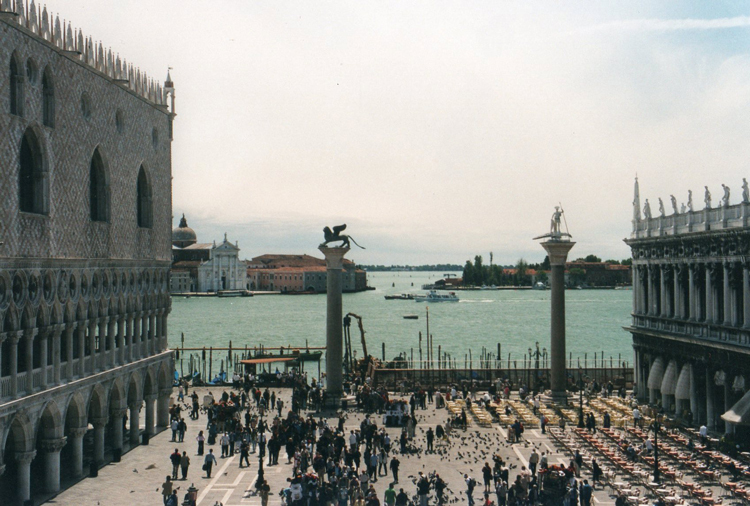 But if you only have one day, you can't miss the great sites, and emerging from the narrow alleys into the grandeur of St Mark's Square is part of the choreography of the place. 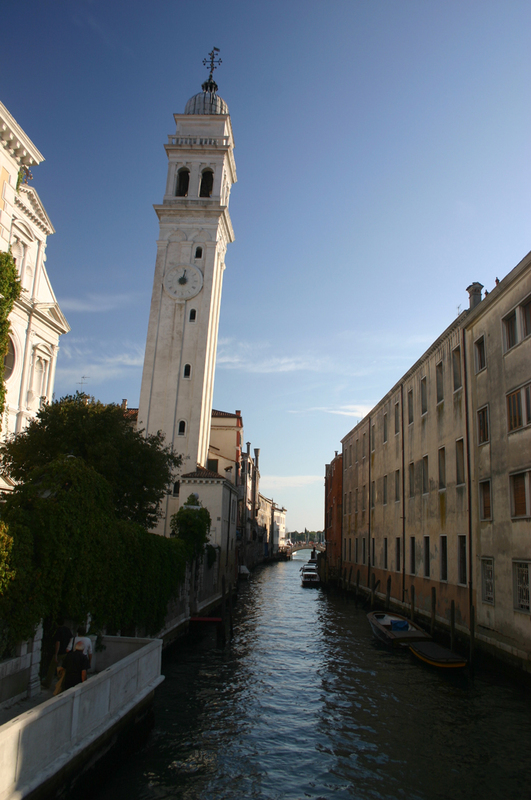 Our rather obvious solution is to propose a walk that allows you to enjoy the great views while also meandering by the back canals. There are many ways of cutting this cake, and this is but one. We don't prescribe a fixed route, as finding your own way between places (and, indeed, failing to do so) is part of the pleasure. 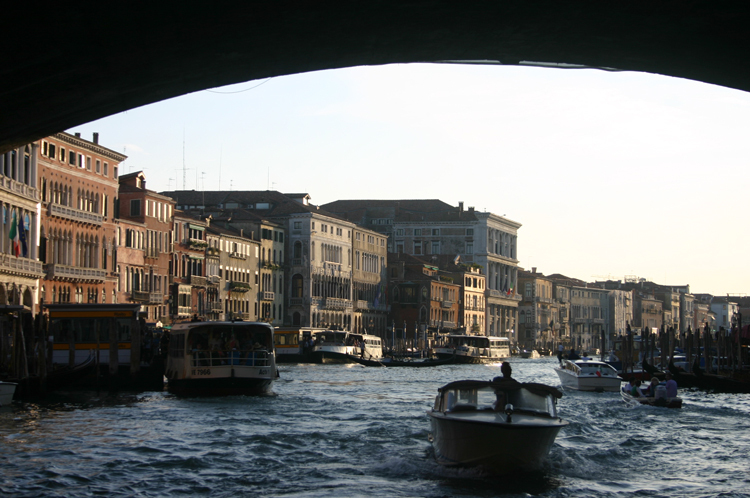 Here and here on, Divert at will to Contemplate the marvels of the Grand Canal ("DCGC") from less crowded vantage points. 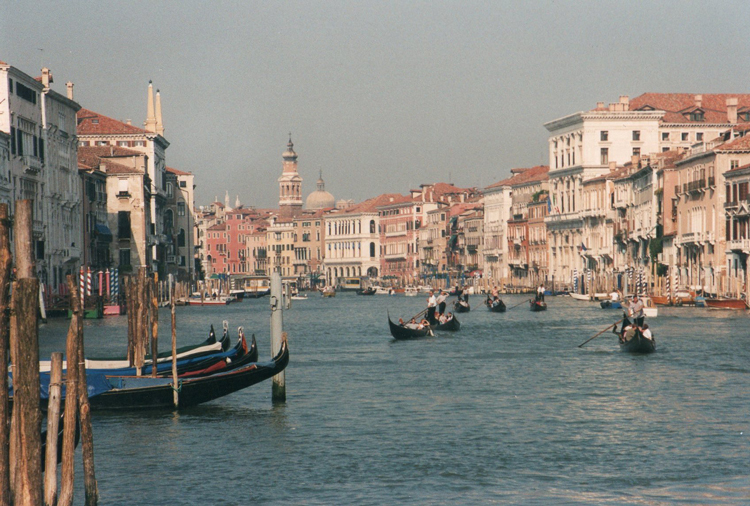 You could start by pottering south(ish) down and back the Riva del Carbon on the St Mark's side. 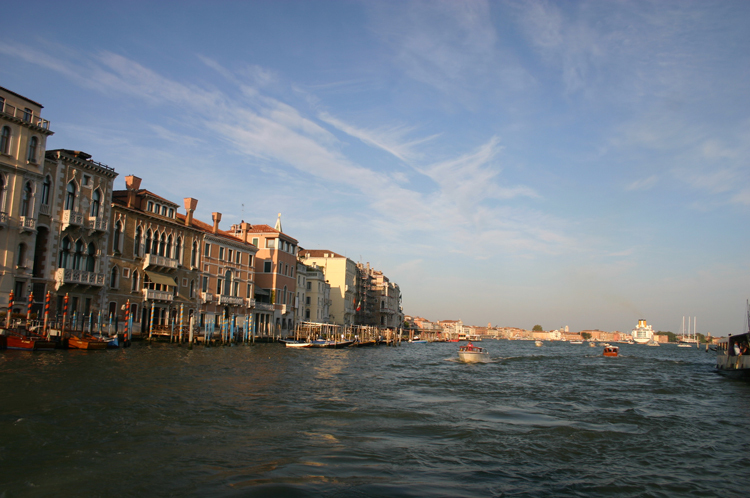 On the far side, head, ACABA, beside or parallel to the Grand Canal (DCGC at will) to Campo San Polo and its fine church. 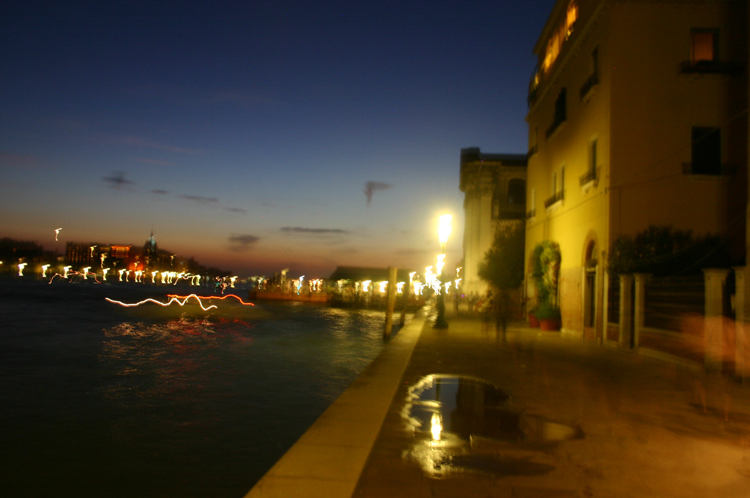 (If you have time to divert to the bank of the Grand Canal west of the Rialto, do so ̶ ). On to Santa Maria Gloriosa dei Frari (huge gothic church with Titia and other masterpieces within) and the extraordinary Scuola San Rocco with its two floors of vast Tintoretto paintings, one of the three most precious buildings in the world according to the ever-opinionated Ruskin (thank you, Mr Links). 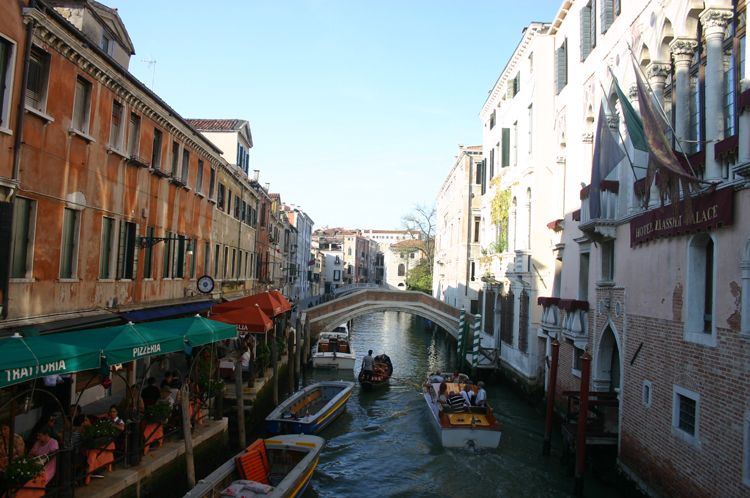 Then onward, ACABA and DCGC via San Pantalon, Campo Santa Margherita and San Baruaba on its delightful canal side campo,to the Accademia, with its marvellous collection (too big to include on this walk) and the eponymous bridge over the Grand Canal (crowded but with supreme views of the Grand Canal). 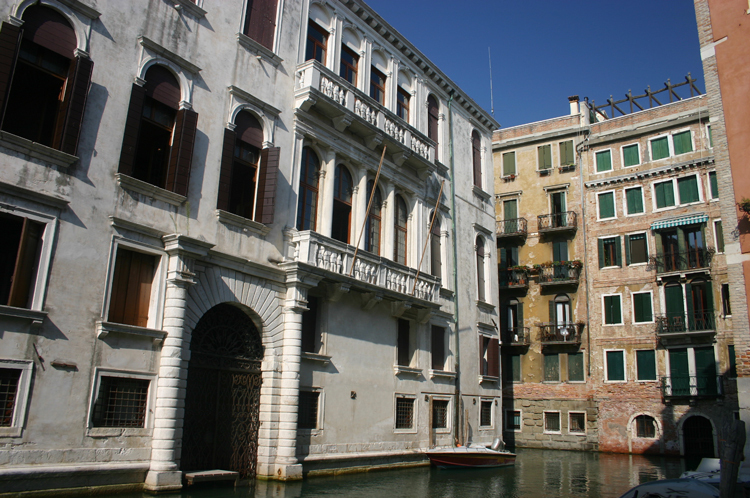 Then onward, down the charming Rio San Trovaso, to the Zattere waterfront, with its sweeping views across the Giudecca Canal to the eponymous island with its long waterfront line of houses punctuated by churches; look out for the perfect, restrained, balanced facade of Palladio's Redentore in particular. 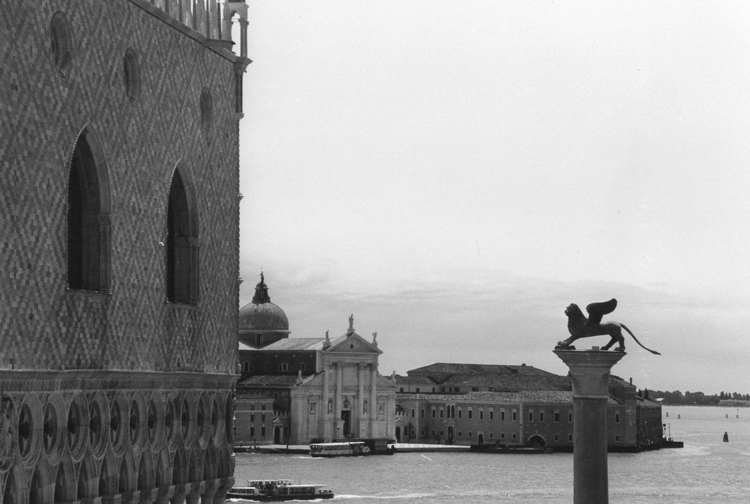 (Big debate: which of it and San Giorgio Maggiore's facades is more perfect?) Some sustenance and view-enjoying here is essential. Finally,drag your weary legs north across the narrowing Dorsoduro spit for a quick squint at the entrance to the Guggenheim Museum and, ACABA, to your penultimate destination, that marvellous if extreme baroque confection - in poor taste, some would say (Ruskin must have hated it) - of Santa Maria della Salute, near the entrance to the Grand Canal. Collapse on its steps and revel in the watery view. 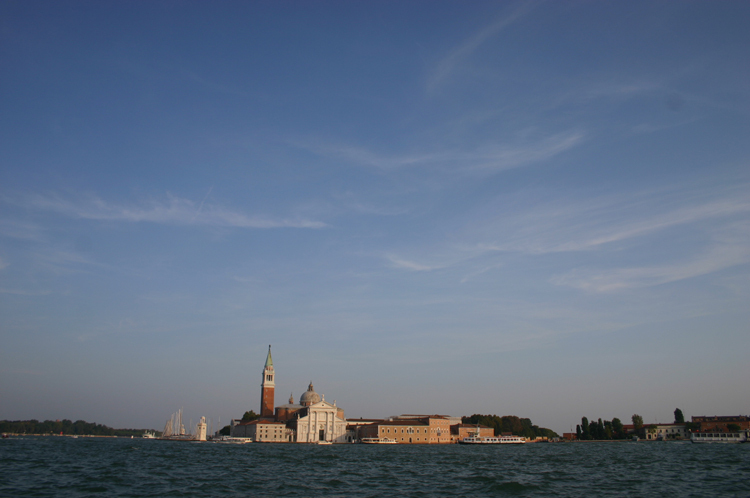 Then a final two minutes on to the Punta della Dogana, the point by the old customs house which separates the Grand and Giudecca canals: perched on its quay, survey the glories of St Mark's Basin from a new angle as you wiggle your toes to check they are still there. WELL DONE!